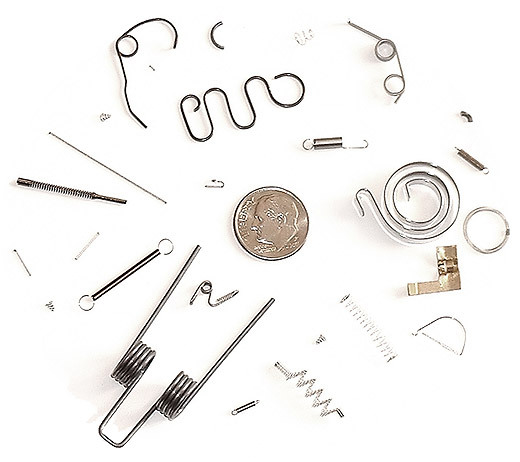 Dayon Springs can produce any type of miniature spring including Compression springs and Extension springs with a wire diameter range of .003" - .187". Outside spring diameters from .014" and up. Wire forms, Flat forms, Torsion springs and Double Torsion springs. Dayon will produce any quantity needed from 1 piece to millions of pieces from all types of materials, including: Music Wire, Pre-plated Zinc, Stainless Steel (All types), Stainless Steel 17-7, Beryllium Copper, Phosphur Bronze, Brass, Elgiloy, Inconel, Ni-Span-C, Hastelloy, Chromel C.